Lawmakers in Oklahoma and other states are proposing new taxes and reduced subsidies on wind power, in part to help hurting budgets. Seen here is the Blue Canyon wind farm in southwestern Oklahoma. Photo by Duggar11, courtesy of Flickr. Oklahoma wind developers are fresh off a record-setting year. Only Texas installed more wind capacity in 2016, a fact that thrusts the Sooner State's power markets into a sudden transition and is agitating opponents along the way. Wind barely registered in Oklahoma a decade ago, but it now accounts for 20 percent of the state's electricity generation. Instead of celebrating, industry leaders find themselves facing a torrent of anti-wind legislation in Oklahoma City, the state capital. By one tally, 88 bills concerning wind development have been filed in the opening days of the legislative session. They range from a proposal to provide advanced notification for new developments to a plan backed by Gov. Mary Fallin (R) that would impose a 0.5-cent-per-kilowatt-hour tax on wind-generated electricity. Most expect Fallin's plan to fail. Wind's importance to the local power grid means there is little appetite among lawmakers to back a bill that could raise consumers' rates. But a proposal to end a tax credit that has helped make Oklahoma the third-largest producer of wind power in the country is gaining steam. "The credit has gone out of control of where it's supposed to be," said state Rep. David Brumbaugh (R), who sponsored a measure to phase out the incentives. "The industry was in its infancy, and now the state is on the hook for hundreds of millions of tax credits." Brumbaugh's concerns hint at a larger issue. As oil- and gas-reliant states like Oklahoma attempt to dig themselves out of a budget hole born from weak crude prices, they are increasingly looking toward wind to help balance the books. There is also this: Some worry the industry's growth represents a challenge to traditional fossil fuels. Wyoming lawmakers shot down proposals earlier this year to raise the Cowboy State's 0.1-cent-per-kWh wind production tax and bar utilities from buying renewables. Budget concerns and allegiance to fossil fuels were both factors behind the proposals. But some express a different set of concerns. Greens are so eager to bring renewables online that they haven't considered the environmental impacts of wind development, said state Sen. Cale Case (R), who authored the tax proposal. He strongly disputes assertions that his plan attempts to prop up the state's ailing coal industry. Instead, Case says taxes are needed to help offset the impacts of wind development and ensure Wyoming benefits from its growth. "I want national people to realize what this means to our Wyoming viewsheds, wildlife," Case said. "I want people to realize how permanent these developments are. It's huge and permanent." In North Dakota, one lawmaker proposed a two-year moratorium on new wind development. He expressed concern that wind power is killing the local coal industry, but ultimately shelved his plan in exchange for a promise the state would study the issue (Energywire, Feb. 24). Wind's opponents argue tax incentives and other laws have distorted the market, effectively forcing utilities to choose wind over cheaper and more reliable fossil fuels. "There are very good arguments for why tax credits are working against the public interest," said Lisa Linowes, executive director of the New Hampshire-based WindAction Group, which opposes industrial-scale wind development. "The states are right to reconsider the subsidies they are providing." Nowhere is the issue more fraught than Oklahoma. The debate has divided the state's traditional political powers. The Oklahoma Independent Petroleum Association, which counts Harold Hamm's Continental Resources Inc. among its members, is a prominent backer of plans to impose a production tax and end incentives for the wind industry. The proposals would level the playing field and help the state fill a nearly $900 million budget shortfall, the association argues. The Oklahoma State Chamber of Commerce, meanwhile, has voiced opposition to Fallin's play, saying wind is a vital source of jobs and tax revenue. The Oklahoma Oil and Gas Association has remained neutral. Much of the fervor is owed to the sheer size of Oklahoma's wind industry. The state installed 1,192 megawatts of wind capacity in the fourth quarter of 2016. That's more than the total capacity of 33 states. A 2015 study conducted by Oklahoma State University at the behest of the Chamber of Commerce concluded that wind installations had increased the appraised value of local tax rolls by $3.3 billion. That's in addition to the $134 million the industry paid in ad valorem taxes in 2014. Wind industry estimates now project the sector employs around 7,000 Sooners. The state tax credit paid to zero-emission energy sources like wind has also grown. The incentive cost Oklahoma $113 million in fiscal 2014, according to a consulting firm hired by the state. Oklahoma can hardly afford to spare the money. Advocates of phasing out the incentives say the revenue could be used to pay more to teachers, who will rank as the poorest paid in the country unless lawmakers approve a salary bump this year. They also argue wind has outgrown the incentives. The state has already exceeded its goal of producing 15 percent of its power from renewable sources, Brumbaugh said. "It's not anything against the wind industry," he said. "It's a budgetary matter. We had a $1 billion shortfall last year and $1 billion shortfall this year." The wind industry, for its part, is prepared to negotiate. Jeffrey Clark, president of the Wind Coalition, said the industry is willing to let the credit expire at the end of 2018, three years ahead of schedule. In exchange, he hopes to preserve the incentives for projects already in development, arguing that it's unfair to investors to change the rules midstream. But he also senses a wider political plot to knock wind back a notch. "As long as they are blaming wind energy for the state budget, they are not talking about tax credits for other industries," Clark said. A tax credit for horizontal drilling cost Oklahoma $427 million in 2016, according to David Blatt, executive director of the Oklahoma Policy Institute. With lawmakers unlikely to approve tax increases, he argues that lawmakers should rein in tax incentives to help solve Oklahoma's budget woes. "It raises questions as to why there is so much attention paid to $100 million to the wind industry," Blatt said. "While wind has done well in the state at the Legislature, it is still a new and not-well-entrenched industry where oil and gas calls the shots." Susan Sloan, vice president for state policy at the American Wind Energy Association, characterized Oklahoma's debate over wind power as a "huge fight," adding that the state has "in some ways become the ground zero" of a broader effort to discredit wind energy's economic benefits to rural America. But she said the most strident opponents of wind power are not rural landowners themselves. Rather, they are individuals and organizations representing fossil energy, or those who have a broader agenda based on political, economic or aesthetic concerns. Sloan said AWEA does not discount what she said are legitimate concerns about wind energy, including how best to integrate turbines and other infrastructure into rural communities. "The bigger the industry gets, the more we're seeing some of these questions, and the wind industry has to continue to do the best job it can to be a good neighbor," she said. "But the idea that rural America doesn't want wind power, that's just not what we've experienced out there," Sloan added. "There are plenty of landowners who are very willing to lease their land, to put up turbines and to earn that additional long-term income." 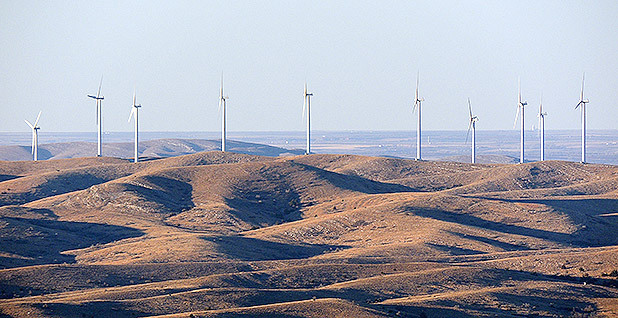 Regarding legislative efforts to roll back wind energy in places like Oklahoma, Wyoming and North Dakota, Sloan noted that those bills often fail at the committee level. "So when the process allows for a true discussion about the pros and cons of wind power, these efforts are not successful," she said.